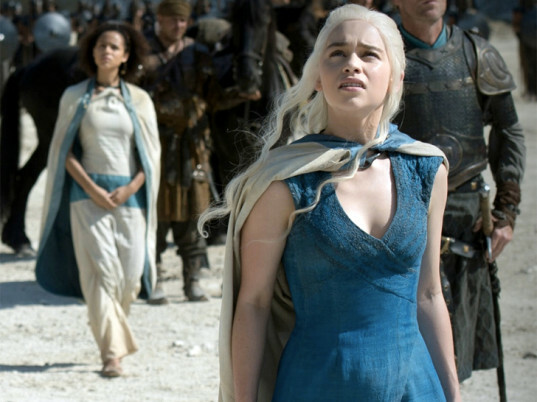 The Mother of Dragons’s (Emilia Clark) signature blue dress features textured smocking stitch, embellished with Italian tubular mesh wire, designed to evoke dragon-scale. As her power increases—and Daenerys prepares to make her way across the Narrow Sea to Westeros—the “scales” grow heavier and more pronounced, eventually covering most of the dress by the end of Season 3. 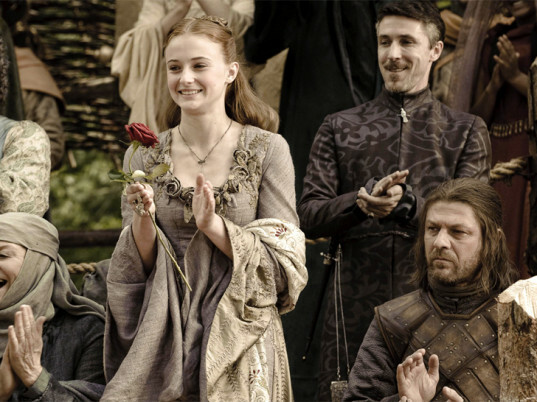 An early dress, worn at the Tourney of the Hand in Season 1, speaks of happier times for House Stark’s older daughter (Sophie Turner). 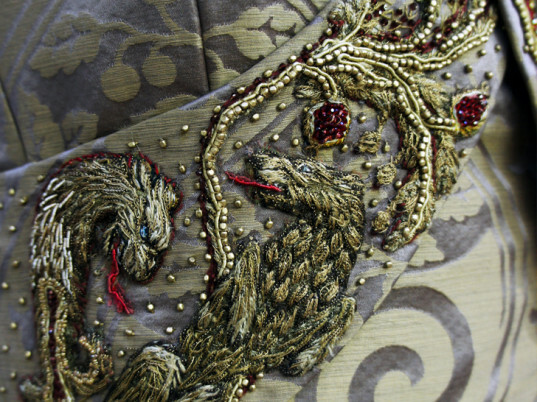 Three-dimensional roses, vines, and leaves trail across the neckline, leading to embroidered her family’s sigil, the direwolf. 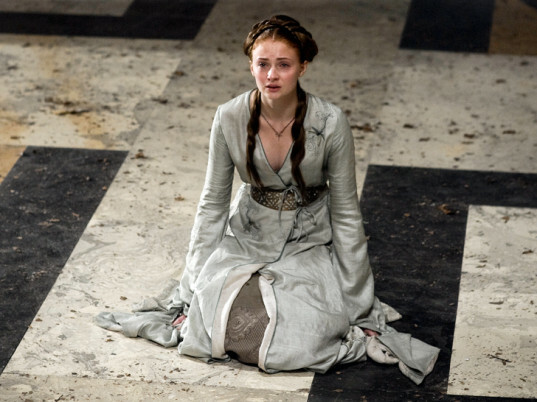 Sansa, a hostage of the royal court in Season 2, adopts a more “Southern” hair and clothing style to fit in better at King’s Landing. 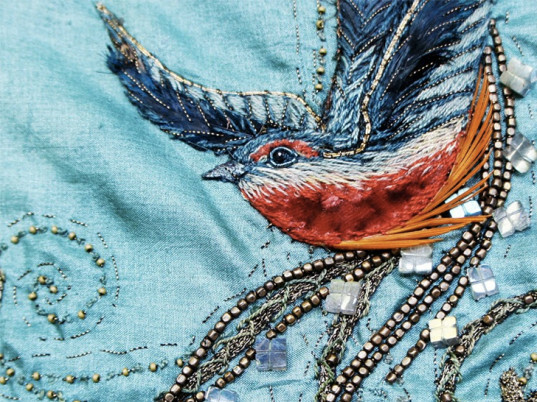 Sansa’s recurring dragonfly motif recalls the ballad of Jenny of Oldstones and the Prince of Dragonflies, one of the knightly romances she enjoyed before reality sets in. 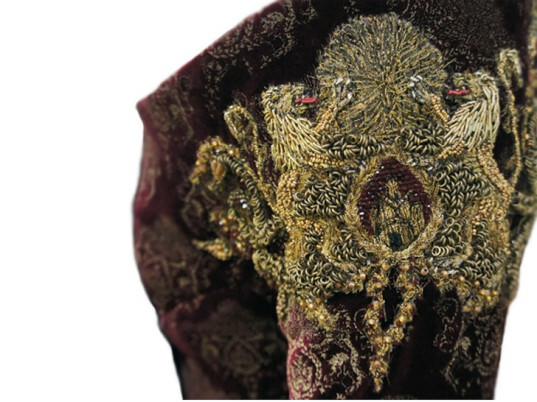 The gown Sansa wears at her wedding to Tyrion Lannister (Peter Dinklage) in Season 3 features a wraparound embroidered band that “symbolistically told Sansa’s life from the Tully and Stark beginnings to the entanglement with the Lannisters,” Carragher writes on her website. Her narrative journey begins in the lower back, where the direwolf and her mother’s sigil, the fish, intertwine. Moving to the front, the direwolf is shown succumbing in battle to the Lannisters’ lion. 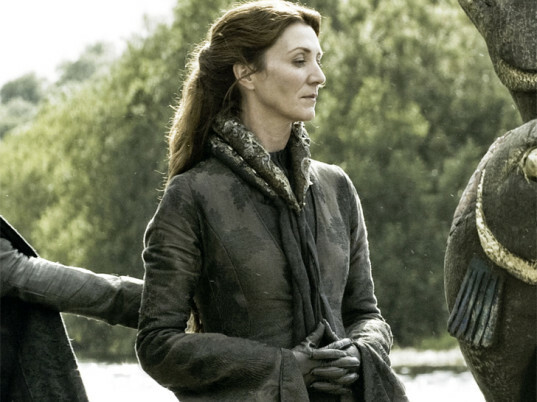 Before Catelyn (Michelle Fairley) married into House Stark, she was a Tully. 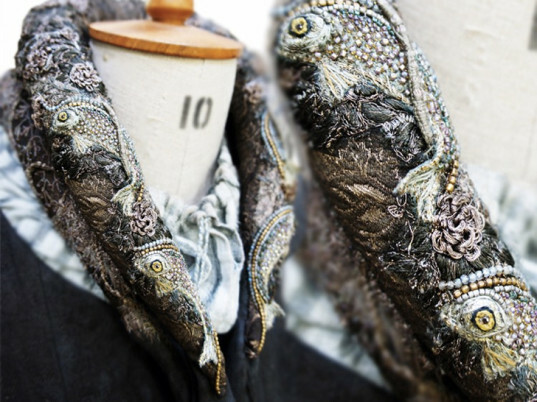 The Tully fish, luxuriating in water, frequently appears somewhere upon her person in tiny beads, particularly on her collar. 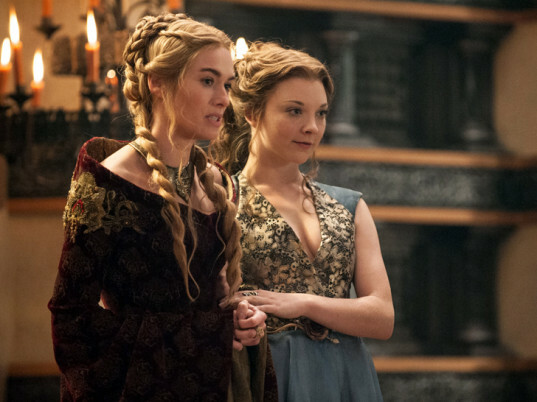 Before her desperation and paranoia came to a head, the conniving Queen Regent (Lena Headey) wore less-aggressive silhouettes in softer colors. 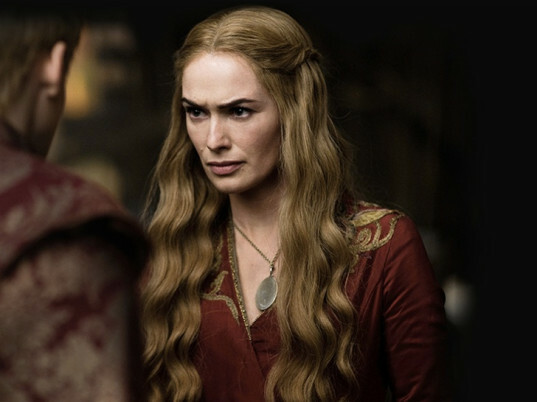 Cersei says she often wishes she were a man. The birds that appeared in her clothing prior to Season 3 may indicate her frustrations as a “caged bird” valued only for her beauty and fertility. As the show progresses, Cersei favors dresses in red and gold, the banner colors of House Lannister. The birds are joined by the Lannister lion, fierce and poised for attack, before they’re replaced altogether. By the time Sansa and Tyrion marry, Cersei is firmly entrenched in her “power” palette. Her clothing becomes a form of armor. The Lannister lion also becomes more prominent as Cersei comes into her own as a political player. 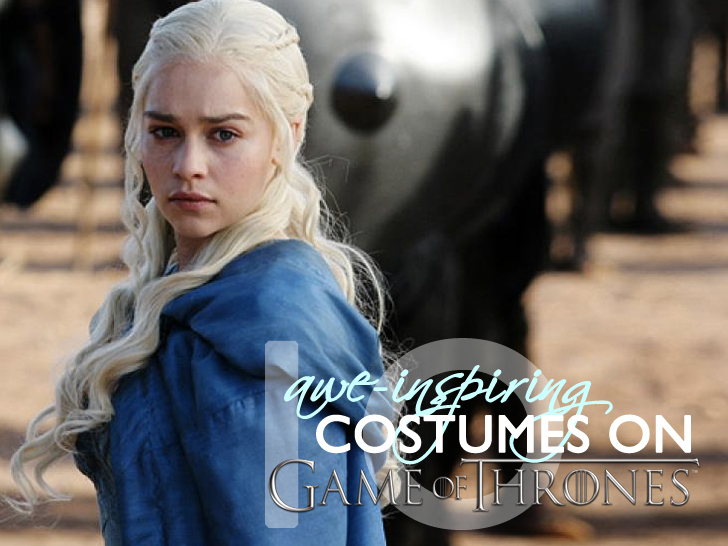 The residents of the city of Qarth, like Daenerys’s hapless suitor (Nonso Anozie), are fond of jeweled insects on their garb. 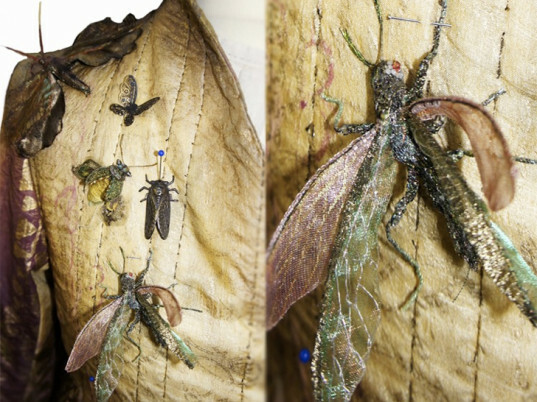 Unlike the flat embroideries of Westeros, the lifelike arthropods look ready to take off at any second. 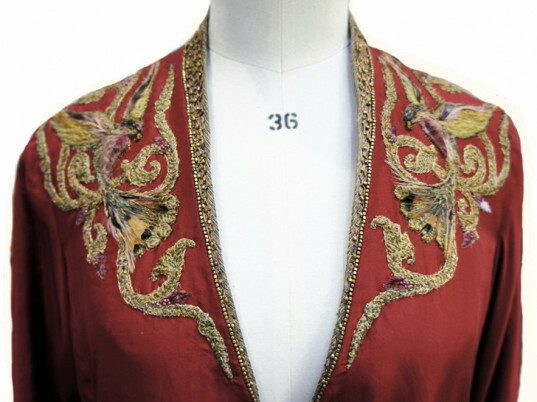 He reveals his flamboyant side with the embroidered curlicues along his collar. 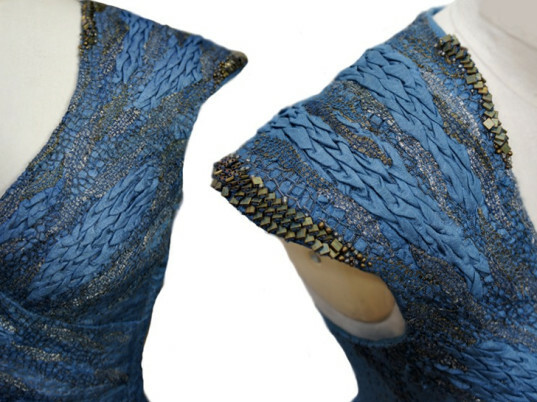 The Mother of Dragons's (Emilia Clark) signature blue dress features textured smocking stitch, embellished with Italian tubular mesh wire, designed to evoke dragon-scale. As her power increases—and Daenerys prepares to make her way across the Narrow Sea to Westeros—the "scales" grow heavier and more pronounced, eventually covering most of the dress by the end of Season 3. 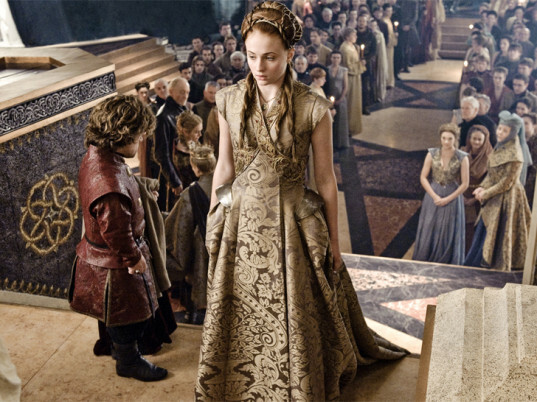 An early dress, worn at the Tourney of the Hand in Season 1, speaks of happier times for House Stark's older daughter (Sophie Turner). 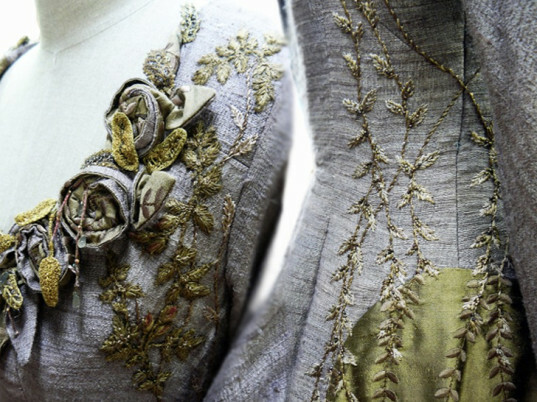 Three-dimensional roses, vines, and leaves trail across the neckline, leading to embroidered her family's sigil, the direwolf. Sansa, a hostage of the royal court in Season 2, adopts a more "Southern" hair and clothing style to fit in better at King's Landing. 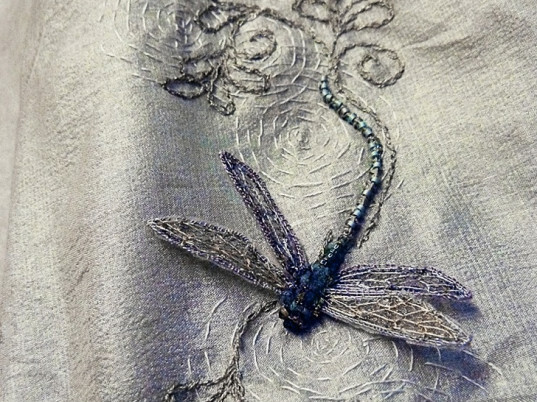 Sansa's recurring dragonfly motif recalls the ballad of Jenny of Oldstones and the Prince of Dragonflies, one of the knightly romances she enjoyed before reality sets in. 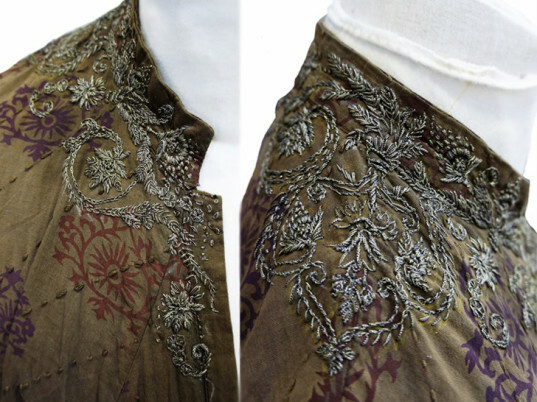 The gown Sansa wears at her wedding to Tyrion Lannister (Peter Dinklage) in Season 3 features a wraparound embroidered band that "symbolistically told Sansa's life from the Tully and Stark beginnings to the entanglement with the Lannisters," Carragher writes on her website. Her narrative journey begins in the lower back, where the direwolf and her mother's sigil, the fish, intertwine. Moving to the front, the direwolf is shown succumbing in battle to the Lannisters' lion. 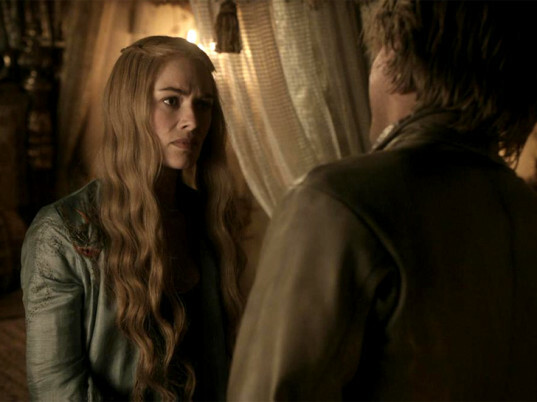 Cersei says she often wishes she were a man. The birds that appeared in her clothing prior to Season 3 may indicate her frustrations as a "caged bird" valued only for her beauty and fertility. The birds are joined by the Lannister lion, fierce and poised for attack, before they're replaced altogether. By the time Sansa and Tyrion marry, Cersei is firmly entrenched in her "power" palette. Her clothing becomes a form of armor. 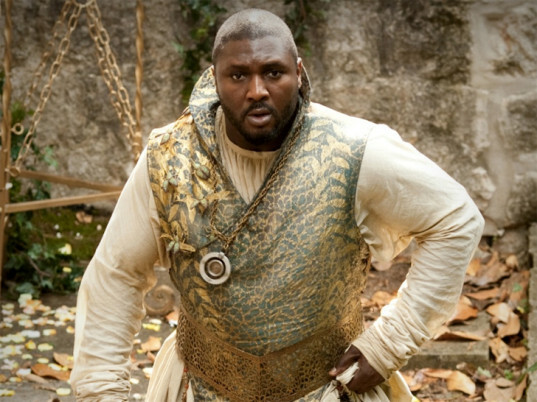 The residents of the city of Qarth, like Daenerys's hapless suitor (Nonso Anozie), are fond of jeweled insects on their garb. 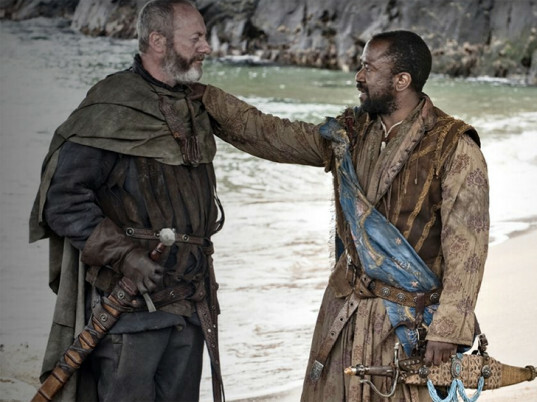 The notorious Lysene pirate (Lucian Msamati) styles himself as the "Prince of the Narrow Sea."